Former world title challenger Rendall Munroe says he does not intend to make any further comebacks after retiring for the second time in 16 months. 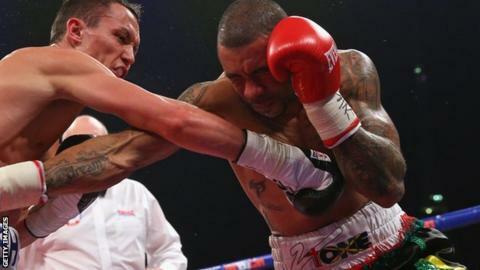 The Leicester boxer quit immediately after losing to Josh Warrington in their Commonwealth featherweight title fight in Manchester on Saturday. Munroe, 33, initially called time on his career in December 2012, only to return less than five months later. For me I don't want to tarnish my record. I always look back and I'm proud what I've done and achieved. "That's it, this is a new chapter for me," he told BBC Radio Leicester. "I'm a grafter, everyone knows I'm a hard worker, and that I'm not afraid to work and earn a living like everyone else. "I've got family at home, and yeah it's alright to say I can go in the ring and earn a bit of money by getting my face punched in a bit more, but there comes when you have to realise that it's not the same anymore." Munroe, who claimed English, Commonwealth and European belts and fought for the world crown against Toshiaki Nishioka in Japan in 2010, first retired after losing his WBA interim super-bantamweight title fight against Scott Quigg. The former binman had reiterated his desire to continue his career despite losing to Lee Selby in their European featherweight title fight in February. However, following discussions with both trainer Jason Shinfield and manager Mike Shinfield, he admits his seventh-round retirement against Warrington spelled the end of his aspirations in the ring. "For me, things are starting to slow down a bit," said Munroe. "Obviously, when fighting at an elite level you need to be on that spot 24/7, and I think for myself that spark is slowly starting to go. "I've always had an agreement with my trainer and manager that when they think it's disappearing then it's time to bow out. "I've been there for 11 or 12 years now, they have seen me come through the rankings, get better and hit the peak. Now they are saying that they can see that I've got fight left in me, but not at the elite level. "Where I was and where I've been, that is where I want to recognised - I don't want to go back down the ladder and fight six and eight round fights. "For me I don't want to tarnish my record. I always look back and I'm proud what I've done and achieved."